A smart way for teams to get a more complete picture on an employee is to use 360 degree feedback. Traditionally, employees get feedback only from their direct managers, which creates a 1-1 feedback process. To get a more complete picture, you want to get feedback from as many sources as possible. There are many pros and cons to using 360 feedback that we’ll go through, but one important thing to understand is that it’s used to measure an employee’s strength and weaknesses, not their performance. This is why it might not be the best idea to include 360 feedback as part of an annual performance review. If you’re planning to use it, it might just be part of your overall feedback and performance management process. In this post, we’ll explain what 360 degree feedback is, talk about the pros and cons, give you some examples of questions, and some pro tips to get you started quickly and easily. Before we do, make sure to grab this free guide on how to give better employee feedback. 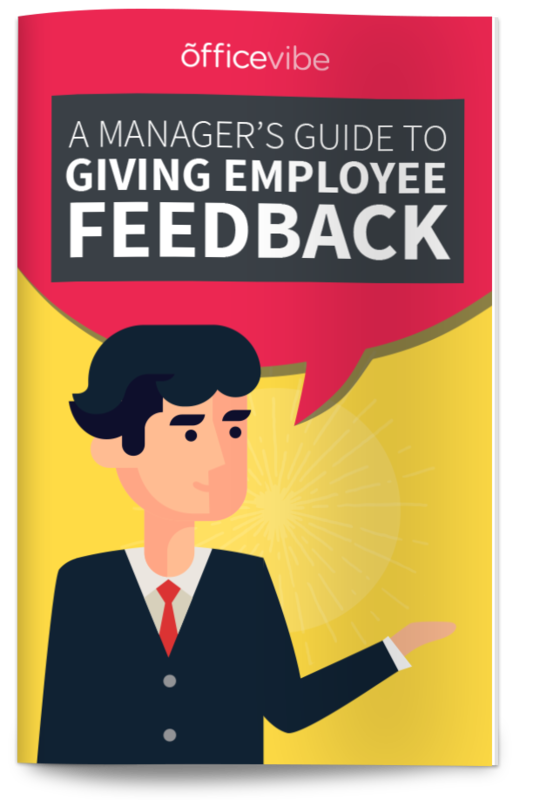 Get the manager’s complete guide to giving better employee feedback that will make your next review so much easier. 360 degree feedback is when you collect feedback about your strengths and weaknesses from everyone around you, hence the name 360 degree. As a manager, if you were the one receiving 360 feedback, you’d collect feedback from your direct manager (if you have one), your employees, your coworkers, and potentially even your customers. Many times there is also a self-assessment that is included in the process. It’s important that the process is anonymous and that everyone rating you gets the same questions about you. At the end, one person (usually your manager) will compile all the results and discover any patterns about where you could improve. Remember, a 360 review is about strengths and weaknesses. A performance review is about the job someone is doing, a 360 review is about an employee’s skills. The goal is to help anyone in the organization (senior leaders and employees) improve their personal skills and behaviours at work. By combining multiple sources of feedback, you’ll get a more complete picture of the employee. There are many pros to 360 feedback, they’re an amazing tool to use, but it’s important for you to remember that it’s all part of a larger feedback process which includes employee surveys, one-on-ones, annual reviews, etc. Because you’re collecting feedback from so many different sources, you have a broader (and potentially more accurate) assessment. You’ll likely notice recurring themes and patterns that you should be focusing on. Also, it’s likely that colleagues or customers have feedback that your direct manager might not have, so you’ll get a more complete picture of your strengths and weaknesses. In theory, if everyone identifies their strengths, weaknesses, and behaviours that they need to work on, they’ll end up becoming better coworkers and the team will be happier and more productive. It’s great to see how others perceive you. The 360 review gives colleagues a chance to anonymously express how they feel about their coworkers, something that doesn’t regularly happen at work. If you’re able to handle feedback and not get too upset about it, you’ll want to know how others see you. The key to handling feedback is to develop a growth mindset and look at it as an opportunity to grow. One of the biggest issues that employees face in their workplace is a lack of frequent feedback. Employees crave feedback, and the 360 review gives them a chance to get more of it from more people. Employees will likely also perceive the feedback as more fair since it’s coming from multiple sources. 360 feedback isn’t perfect, and unfortunately many teams will implement it for the wrong reasons. You need to be very careful when doing this. If your culture already has an issue of trust or the team isn’t getting along well, this might only worsen the problem. If the feedback received is negative, it can create a lot of resentment on the team, where the receiver is angry at their colleagues or customers, inducing emotions like fear and anger. The feedback that’s received might not be 100% accurate. Your colleagues might want to be nicer that what they really feel, or maybe due to internal politics they’re dishonest to be mean. If you’re on a small team and everyone’s friends with each other, can we really be that critical of each other? On the flipside, if you’re on a very large team, do the people reviewing you really know you well enough to give you an accurate assessment? The point is, be careful with the data you’re collecting. The review can focus too much on an employee’s weaknesses and not enough on their strengths, which can be pretty discouraging. It’s okay to highlight areas for improvement, but remember to focus on strengths and how that strengths can be leveraged more on the team. Here are a few sample questions you can use for your 360 feedback review. Does this employee seem motivated at work? When conflicts arise, does this employee handle it well? Is this employee committed to the success of the organization? Does this employee display leadership skills? Have you experienced any problems with this employee personally? Does this employee pay attention to detail in their work? Is this employee a good communicator? Does this employee manage their time well? Do you trust this employee that they’ll do what they say they’ll do? If you’re looking to get started with 360 feedback, here are a few tips to keep in mind as you get started. You need to have a reason for why you’re doing what you do, how you’ll use the results, and what people should expect. What skills/strengths are important for us here? (hint: tie them to your core values). What are we going to do with all of the data we collect? How will we keep that going over time? If you’re just getting started with 360 reviews, it’s natural that employees might be a bit nervous or scared about what to expect. It’s your job as a manager to remove that fear and explain exactly how to process will work. Explain how the anonymity works, that they should be honest, why you’re doing this, etc. One last tip to keep in mind is not to make your survey too long. Survey fatigue kicks in very quickly, and with something like this you want the information to be as accurate as possible. Take the survey a few times yourself to see how long it is and where you could potentially remove to make the process as simple as possible. Do You Use 360 Degree Feedback? Anything to share with our community about how you do it at your organization?